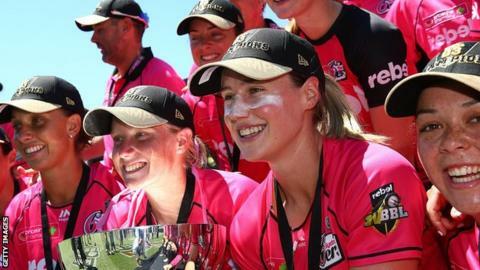 Sydney Sixers secured a dominant victory over Perth Scorchers to claim their second successive Women's Big Bash title at the Adelaide Oval. Perth Scorchers, who included England's Katherine Brunt and Natalie Sciver, won the toss but were bowled out for 99. Sarah Coyte was the stand-out bowler for the Sixers as she took 3-17, while Ireland's Kim Garth took 1-7. In reply, Alyssa Healy scored 41 before Ellyse Perry and Ashleigh Gardner led the Sixers to victory in 15 overs. Perry was unbeaten on 36, while Gardner was 22 not out as they helped their side win the third staging of the WBBL. As well as Garth, England reserve wicketkeeper Amy Jones finished on the winning side - although she was not required to bat.